In 2011, ULC acquired a .96 acre property for $1.2 that eventually became home to Evans Station Lofts. Denver’s Transit-Oriented Development (TOD) Fund financed the acquisition. At the present time, this was ULC’s fourth purchase using the TOD fund. The fund’s goal is to increase affordable housing along transit corridors. Evans Station Lofts sit adjacent to the Evans Light Rail Station, along RTD’s C and D lines. ULC partnered with affordable housing developer Medici Consulting Group (MCG) who received low income housing tax credits to finance the development. Presently, the five-story development includes 50 units of affordable housing units and 7,100 square feet of commercial space. The workforce housing development opened in 2013. 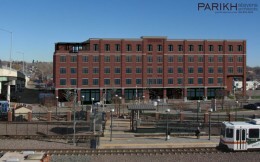 Evans Station Lofts is a transit oriented development that was built in 2013. ULC met with the developer, property manager and a current tenant to discuss the need for affordable options in Denver. Check out the latest progress on Evans Station Lofts! So excited to celebrate the grand opening with Medici Communities – stay tuned for details! Construction is well underway, and a summer grand opening is well within reach! Contact Medici Communities for rental inquiries. Check out the nice views in the video below from the 4th floor! Evans Station Lofts scheduled for a July 2013 completion. Check out the construction progress on this video by Medici Communities! Construction continues at Evans Station Lofts! Take a look at what is happening at Evans Station Lofts, this next phase of construction shows the foundation, things are moving right along! Enjoy part 2 of the series.